Publisher: Sony Computer Entertainment (SCE), Square Enix Co., Ltd.
Bushido Blade (ブシドーブレード Bushidō Burēdo) is a 3D fighting game developed by Light Weight and published by Squaresoft and Sony for the PlayStation. The game features one-on-one armed combat. Its name refers to the Japanese code of honor, Bushidō. Upon its release, the realistic fighting system in Bushido Blade was seen as quite innovative. 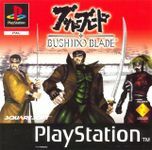 A direct sequel, Bushido Blade 2, was released on the PlayStation a year later. Another game with a related title and gameplay, Kengo: Master of Bushido, was also developed by Light Weight for the PlayStation 2. The bulk of the gameplay in Bushido Blade revolves around one-on-one third-person battles between two opponents. Unlike most fighting games, however, no time limit or health gauge is present during combat. Most hits will cause instant death, where traditional fighting games required many hits to deplete an opponents health gauge. It is possible to wound an opponent without killing them. With the game's "Body Damage System," opponents are able to physically disable each other in increments with hits from an equipped weapon, slowing their attacking and running speed, or crippling their legs forcing them to crawl. Notably, the North American release of Bushido Blade had one minor graphical change: blood was added, replacing the yellow flash that appears during a fatal blow. The game features eight weapons to choose from in many of its modes, including katana, nodachi, long sword, saber, broadsword, naginata, rapier, and sledgehammer. Each weapon has a realistic weight and length, giving each one fixed power, speed, and an ability to block. A variety of attack combinations can be executed by the player using button sequences with the game's "Motion Shift System," where one swing of a weapon is followed through with another. Many of these attacks are only available in one of three stances, switched using the shoulder buttons: high, neutral, and low. The player also has a choice of one out of six playable characters. Similar to the weapons, each one has a different level of strength and speed, and a number of unique special attacks. Some characters have a subweapon that can be thrown as well. All the characters have differing levels of proficiency with the selectable weapons and have a single preferred weapon. Characters in Bushido Blade also have the ability to run, jump, and climb within the 3D environments. Because battles are not limited to small arenas, the player is encouraged to freely explore during battle. The castle compound which most of the game takes place in acts as a large hub area of interconnected smaller areas including a cherry blossom grove, a moat, and a bridge labyrinth. Some areas, such as the bamboo thicket, allow some interaction.